I was thinking recently about my time in the South Pacific and decided to use the Internet Archive Way Back Machine to see if I could find the website I created from scratch when I worked in the region in 1999-2000. Sure enough, this wonderful “machine” pulled up the defunct Canada-South Pacific Ocean Development Program (C-SPOD) website and I was able to take a trip down memory lane. On my first trip to Samoa in early 2000, I had the chance to visit a Canada Fund project in the tiny community of Saoluafata Beach. It was an amazing day spent dodging pigs and chickens while travelling far too fast in a pickup truck on claustrophobic dirt paths and along scenic hairpin highways that hugged the rugged coast. The women from the Women in Business project that I travelled with, Aiga Malaulau and Adi Tafuna’i, were amazing. I often think of them and their project when I see fair trade coconut oil products at the Body Shop and in the grocery store. When I recently took a look at their site it turns out their cold-pressed coconut oil is part of the Body Shop’s line! When I picked up their Spa Wisdom Polynesia Monoi Miracle Oil and Cocoa Butter Body Butter I was actually supporting a fair trade project that I’ve visited! It sometimes feels like a very small world, doesn’t it? 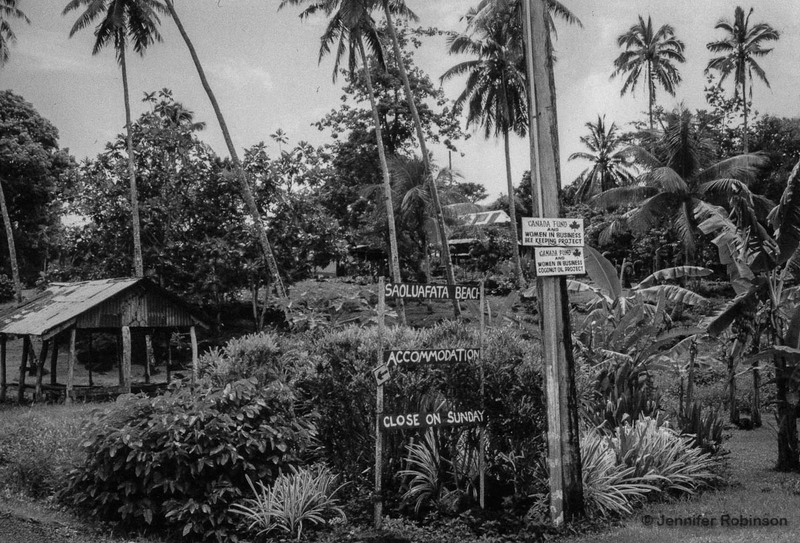 Standing in a tin roofed fale, Aiga Malaulau and her extended family work silently six days a week in Saoluafata Beach, Samoa, hacking, grinding, spreading, and squeezing what is essentially liquid money from piles of coconuts heaped under a nearby tree. Pressed and strained through a micro sieve and then poured into a plastic bucket, the pure virgin coconut oil from Saoluafata is destined for manufacturers in Australia and New Zealand who will turn the Samoan oil into fancy bath soaps, shampoos, sunscreens, mosquito repellent, and even cooking oil. For each litre of oil Aiga and her family produce in their tiny village next to the Pacific Ocean, a 30-minute drive outside the capital of Apia, they receive three Samoan tala ($1.42 Cdn). On an average day, they manufacture 1 ½ to two buckets, approximately 40 litres. Three years ago, the Malaulaus were chosen by the Apia-based Women in Business Foundation as one of five Samoan families to take part in a coconut oil production project. The goal is to help provide employment for three to four people per operation in rural areas lacking private business and job opportunities. 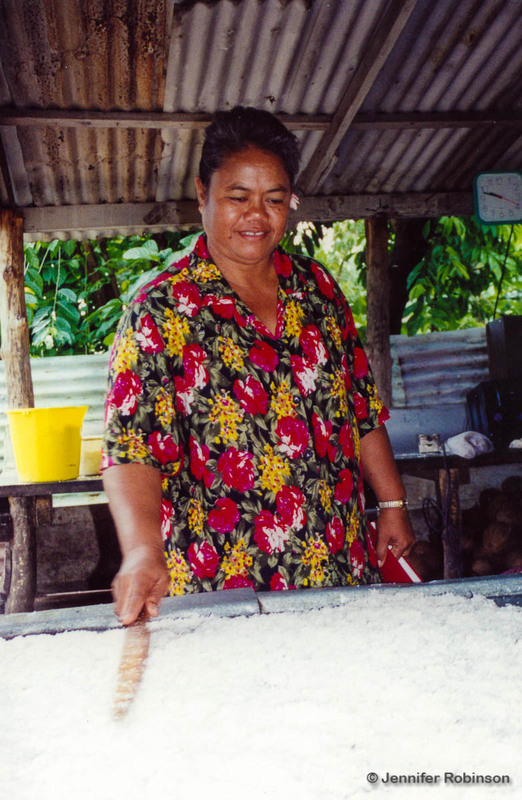 Since 1996, Women in Business has purchased and placed dryers and oil presses with two rural families on Upolo and three on Savai’i. The equipment, worth approximately $15,000 Australian for each site, along with two vehicles and mobile phones for monitoring the sites, has been purchased with the support of Canada Fund. The fund provides financial support for small-scale projects, with an emphasis on helping people to help themselves, in developing countries around the world. To be accepted, the projects must meet basic needs; promote human rights, especially the participation of women; improve infrastructure; protect the environment; and support small business development. The Canadian International Development Agency (CIDA) provides the cash for Canada Fund, which is administered in the Pacific through the Canadian High Commissions in New Zealand and Australia. 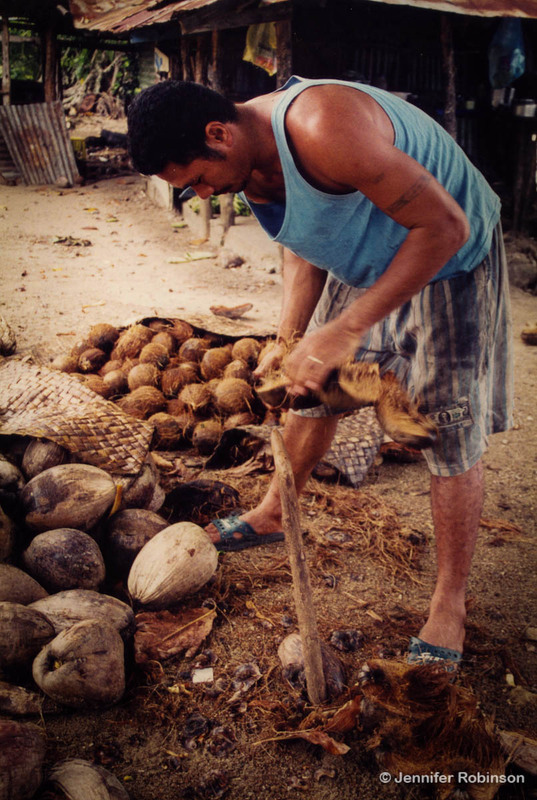 Although using abundant supplies of coconuts for copra and oil is nothing new for the developing Polynesian nation, the family-based method of production is a departure from larger — and less successful — community run models, Tafuna’i says. A visit to a handicraft fair in Fiji and the introduction of new coconut oil production technology provided Women in Business with their ideal village business. 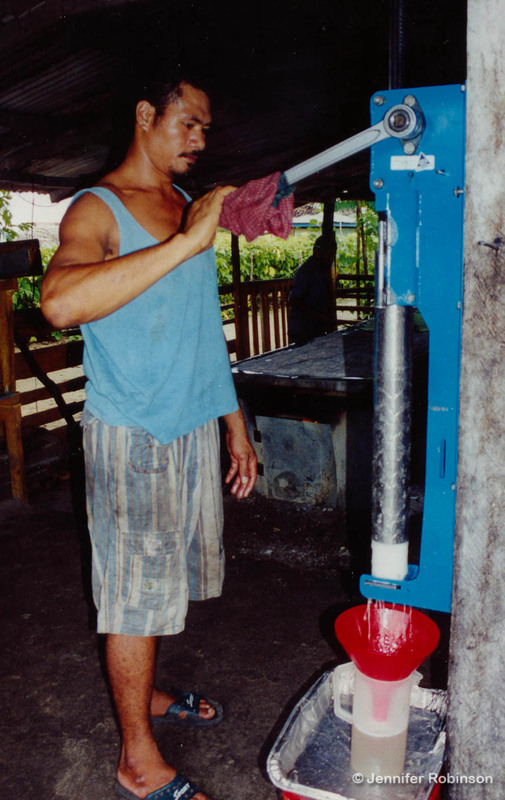 However, initial training in Fiji — where presses were put into villages — didn’t seem to be working. Based on their experience in Samoa, the foundation realized that families better manage any income-generating activity than communities. Not only are villagers taking advantage of an unused resource virtually lying at their feet, the entire process is environmentally friendly, she says. Coconut meat is collected and used as feed for pigs and cattle, the husks are used for firewood to operate the dryers, and the coconut shells can be used for jewelry. However, making coconut oil is hard, hot work with relatively little to show for the effort at the end of the day. Working six days a week for about eight hours a day, the families collect coconuts, husk and split them, dry the ground coconut, and then squeeze the dried coconut through a press to produce the oil. 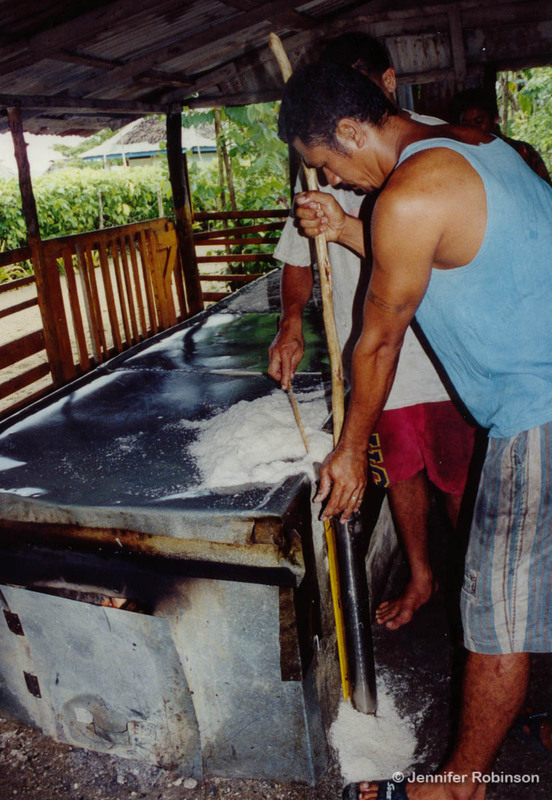 Known as cold pressing, the technique enables the villagers to make a product that retains all of its natural qualities, unlike copra oil which needs more processing before it can be used, Tafuna’i says. A private company, independent of the foundation, is used to market and sell the oil. Producers pay the foundation a fee or its services and eventually it will receive a portion of any profits made by the exporting company for administrative needs. The oil is shipped on a monthly basis to a company in Australia, as well as to smaller markets in Hawaii and New Zealand. Other companies in the United States have also expressed interest, she says. Plans are also in the works to double the value of the oil. The foundation is presently working with AusAID to have the land where the coconuts are collected organically certified. If that is successful, producers will collect seven Samoan tala for a litre of oil, a 130 per cent increase. New Zealand is also funding a feasibility study and a technical evaluation of the oil to produce other value added products. Founded in 1991 by a group of seven women, the Women in Business Foundation originally catered to women members. After the devastation of Hurricanes Ofa and Val in 1990 and 1991 and the taro blight in 1993, which devastated Samoa’s staple food and main export crop, the foundation shifted its focus. Now, it concentrates on helping rural women and youth by giving them opportunities for income generation by using the products of their environments. This article originally appeared in the September 2000 issue of Tok Blong Pasifik published by the Pacific Peoples’ Partnership in Canada. Time to Retire Travelling Purple Chucks? Where can I purchase the coconut pressing machine from for a group of rural women in Solomon Islands? Hi Stanley, I’m sorry but I don’t know. This was a Canada Fund funded project from 2000. Awesome! Great read! Im currently working on a project to import Samoas coconut oil to the UK through WIBDI. Hopefully and fingers crossed there will be Samoa coconut oil products in the major retail chains around the UK. Massive potential in the market here. Good luck with your project. Samoa is a great country, filled with lovely, hard working people. Let me know how it works out! Hi There, I was wondering if I could please get a private email contact for you please? I would love to learn more about this. I am a Samoan documentary film maker and have a growing interest in Samoa’s coconut industries!